This was taken in the Invergordon in the late 50s or early 60s and shows the Invergordon SWRI commitee. 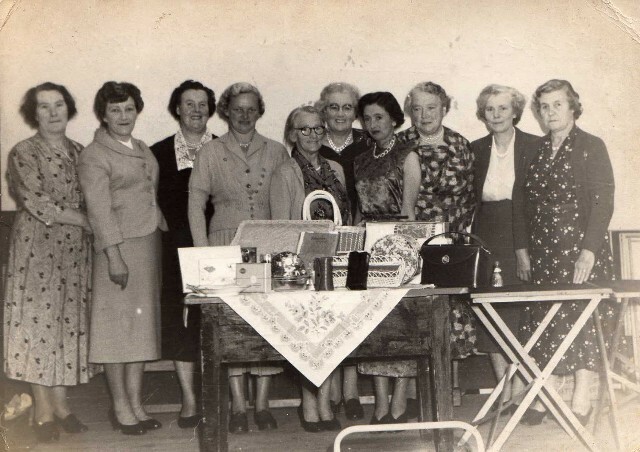 Left to Right: Mrs Archibald, Mrs Peterson, Mrs King, Mrs Ross, Mrs Miller, Mrs Urquhart, Ms Tuach, ??? ?,Mrs Campbell, ????. Can anyone help to fill the blanks, or correct the names, if they are incorrect. Next to Mrs. King is my Aunt, Hazel Mackenzie, who died a few years ago. Her husband, David, was a drummer with British Legion Pipe Band and they have a daughter Ishbel who now lives in Dingwall. Sorry, I should have known that, as I used to deliver messages to her when I was the foreman driver of Rod MacGregors message bike. Did they live in the prefabs up at the cottages? Hi there Rosalie, I do not seem to remember you either. Willie MacKay, my brother in law, thinks that you had probably flown the nest by the time we came to live in Inverg. I remember your sister Janette and used to have the odd dram with her husband Heck. This site is great for keeping all the people with an interest in the old town in touch. Hi Gordie, Yes, they did live in the prefabs up at the cottages. I think I should know you but I just can't place you. Old age fogs the memory !!!!!!! Gordie, is your sister's name Brenda? If so, I know her and your parents. I agree, this site is fantastic for keeping people in touch. Rosalie, what was he like as a boss? Yes Rosalie, I am Brenda's brother, but I didn't work in Invergordon when I left school, which would probably explain how we can't place one another, though I seem to remember something about you working with Ali Baba in the cinema. Harry, after I was ice-cream girl, and a few years later, I was in the ticket office or as Ali Baba would say "the Box Office". He was a very good boss although quite strict. Two girls from Outram Street took the tickets, Mary Mellon, and Mary Russell - also Margaret Hendry - I think she too was from Outram Street. I can't remember the chap's name who also worked there and I think the other woman was a Calder but I can't remember. Gordie, I just heard about Willie's passing, sad day. I was hoping to see him again, but alas, no. Please convey my condolences to Brenda, thanks. Hi Eddie, I cant still place Peter Taylor, although I do recall my grandfather mentioning him. Do you remember an Andrew that was married to Big Mina that lived on Joss Street. Andrew also worked in the dockyard and had some connection with the Pilot boat on and off?